Against the background noise of ridiculous Apple rumors, television ambitions are constant. Apple wants to be a TV network, will build a flat-screen industry-changer, or soon will release stunning new set-top box. Sources are vague; days, months, and years pass devoid of the next big thing. Today, Aaron Pressman (@ampressman) tweets story: “Apple’s Promised TV Revolution Will Be More Of The Same Crap, Thanks To Terrified Cable & Broadcast Executives” by Karl Bode for TechDirt. My reply: “They should be scared. 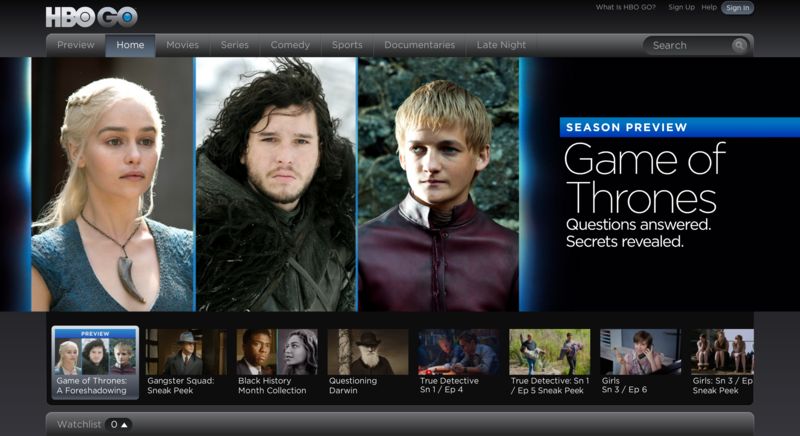 The day HBO GO is stand-alone subscription, I’m done with cable forever”. Karl refers to Wall Street Journal story “Apple in Talks to Revamp Set-top Box“, which like most of the others cites unnamed sources asserting Apple’s repeated failure to secure licensing rights to stream TV shows. The Journal claims that Apple, as part of Plan B, “would rely on cable providers to acquire programming rights from media companies, rather than acquire them on its own, the people said”. Who are these people? How reliable are these sources? I wonder. Karl’s analysis/commentary picks the Journal’s bones for bits of rumor to opine/report about. The TechDirt piece is so much better read. Starting with slug: “from the killing-innovation-in-the-cradle dept”. Or this: “The road toward TV disruption is littered with the corpses of countless similar projects from the likes of Sony, Microsoft, and Google. With a few small successes, every last one of them has inevitably run, face-first and at full-sprint, into a restrictive broadcast-industry content licensing wall used to prevent disruption”. Gimme more metaphors, baby. The Journal story is lifeless, by comparison, but isn’t that typical? I digress. The Journal’s news report, citing Time Warner as one of Apple’s potential partners, published close to the first Comcast-TW rumors (later confirmed) on February 12. I wonder just how coincidental the timing. Reporters should always ask whenever they are leaked information: Who benefits? Who gains from the information disclosure? You have here the nation’s number one cable provider looking to acquire the second-largest. Mergers like this big go through a brutal government reviews process. Acquisition approval is sure to require concessions, and now is the time for third-parties to make demands. Like Apple. The Fourth Estate’s role is vital. Let flow a stream of probing news stories illuminating broadcast and cable licensing deals, copyright and regulatory restrictions, and consumer benefits of preserving the status quo or upsetting it. Such stories are in the public interest. Surely Apple, with payment infrastructure already in place, could offer HBO GO standalone or bundled with other channels cherry-picked a la carte. Comcast is part-way there now, with the Internet Plus—25Mbps Net connection, basic cable, and HBO GO—option, starting at $39.99. Here in San Diego, Cox offers a basic channel tier with HBO and GO for $24.99 per month, or $64.99 with 25MBps Internet. But imagine if to approve the deal, the new Comcast would be compelled to offer consumers a la carte plans and choice of select channels. You pay only for those you want to watch. Better still: Separate premiums from cable, something content distributors like HBO might not willingness adopt. Increasingly, I watch streamed content from the likes of Amazon, Hulu, and Netflix because it’s contextual. When I want. Where I want. On what device I choose. “House of Cards” Season 2 is out today, while Amazon runs its pilot season—where viewers choose which shows will become series. The more, and better, original content these three services provide the less appealing is cable. To the status quo, I say: Get with it, or get out of town. Change is inevitable.